We frequently get questions from our visitors complaining that their electricity bills vary quite a lot and if they should get their meters checked. Although effectiveness of meter can go wrong and there are methods to get them verified and fixed, but the first thing that one should do is check personal electricity consumption. And while checking electricity consumption one should always remember that electricity bills vary with seasons. Although the usages of appliances remain the same, the electricity consumption of some of the appliances (like air conditioners, water heaters, refrigerators and room heaters) may vary with temperature. This happens because these are all thermal appliances and their consumption depends on atmospheric temperature. Air Conditioners: Air conditioner is an appliance that removes heat from an enclosed space. The amount of heat it has to remove depends on few things: room temperature, thermostat setting and even the temperature outside the room (as the heat flows through the walls inside the room). If the heat in room is more, then the amount of electricity air conditioner consumes will be more (at a given thermostat setting). So air conditioner will consume more electricity during summers than in other seasons for the same thermostat setting, just because there is more heat in the room during summers. Refrigerators: Refrigerators also remove heat from products kept inside it and moves it outside. The electricity consumption depends on the temperature of products kept inside it, thermostat setting and temperature outside the refrigerator. If the temperature of products kept inside the refrigerator is high then the amount of heat in the refrigerator is high and more electricity will be consumed to remove it. In summers, general temperature of the things is high and thus more heat is there in the refrigerator. Secondly the ambient temperature is also high and thus compressor consumes more electricity to throw out the heat. Thus electricity consumed is more during summers than in winters. Water Heaters: Water Heaters are opposite of ACs and refrigerators. They consume more electricity in winters than in summers. The electricity consumption of water heaters depends on the hot water usage, tap water temperature and thermostat temperature. In winters, tap water is cold and thus more heat or electricity is required to heat it. Also in winters hot water usage is more because the water to which it is mixed (to normalize the water temperature) is also cold. Thus electricity consumption of water heater is more in winters than in summers. Most appliances are designed to a specific size. A 1 ton AC is designed to remove a certain amount of heat per hour (also called as BTUs per hour). A compressor of a refrigerator is also designed to remove a specific amount of heat per hour. But as we have seen above, the amount of heat varies with seasons and thus inefficiency comes in the appliance when amount of heat is more or less than what it is designed for. Invertor technology enables appliance to adjust to the amount of heat that is there in the system and thus it makes sure that appliance runs efficiently in all seasons. 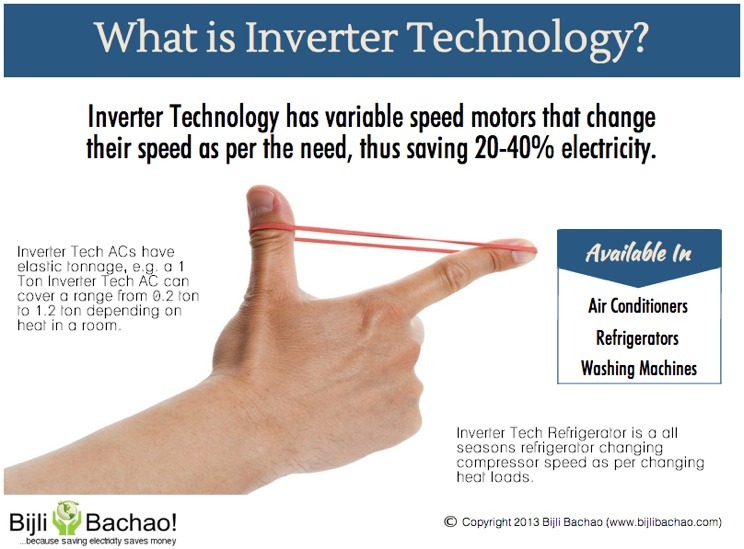 So if an appliance is used in all seasons, an inverter technology appliance helps.